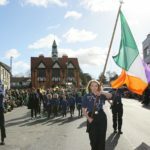 We are delighted to announce the details of our first event of 2019, the Bray Chamber and District President's Dinner. This black-tie event takes place in the Esplanade Hotel, Strand Road, Bray on Friday 15th February starting at 7.15 pm with a Prosecco Reception, in what promises to be a great evening of networking and socialising for the business community in Wicklow. Its important for local businesses to connect and create partnerships and what better way than with an evening dedicated to growing local business connections. Our guest speaker this year is Colm Lyon - see bio below. Tickets prices: €70 per person Table of 10 - €650 including a company ad placed on WV screen on the night. Early bird tickets: Booked before January 25th - €65 per person To book tickets or Sponsorship opportunities please contact the Chamber office on 01 2828248 or email info@braychamber.ie. 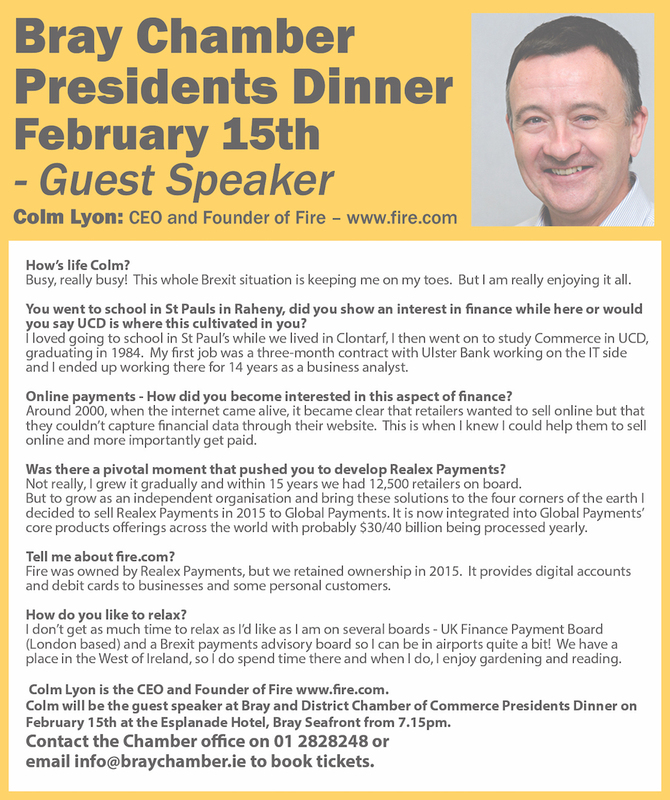 Colm Lyon is the CEO and Founder of Fire – www.fire.com. Fire Financial Services – trading as Fire and fire.com provides digital accounts to businesses and personal customers based in the UK and Ireland. Fire accounts are opened online and provide customers with access to a range of payment and data services, along with a carefully crafted interface that is designed to create a compelling customer experience. Colm was the founder and CEO of Realex Payments up until the time the business was acquired in March 2015 for €115m by Global Payments. From 2000 to 2015, Colm led Realex Payments to be one of Europe’s largest online payment gateways – processing in excess of €28B euro per annum in online payments for over 12,500 retailers, including some of the world’s leading brands – Vodafone, Aer Lingus, Virgin Atlantic, Paddy Power, Chain Reaction Cycles, AA, 32Red, notonthehighstreet.com to name a few. At the time of the acquisition Realex Payments employed 170 people, had clients in 30 countries and offices in Dublin, London and Paris. 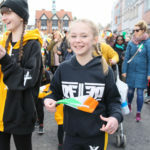 Colm is heavily involved in working with the internet community – chairing the Irish Internet Association for several years and founding the Internet Growth Alliance. The latter was a significant force within the internet community and contributed to the highly acclaimed Internet Growth Acceleration Programme (iGAP). He has been acknowledged with numerous awards over the years.